Overview : Another exclusive product from XCM, this cable will let you connect your non HDMI Xbox 360 with an HDMI cable to a HDTV or DVI monitor with a high resolution signal of 1080i thanks to XCM HDMI 1080i Cable for Xbox 360 without HDMI Port. You can now enjoy the same resolutions than people with Xbox 360 Elite! High quality 3rd party product. Converts the analog signal to digital signal and acts as a HDMI digital signal solution for HDMI-less Xbox 360's. Comes extra RCA sockets and optical socket for connection to speakers. Comes with a HDMI to DVI adapter - can be used on a PC monitor as well as a HDTV. Quality/Usability : Recently within the past year, Microsoft has started to include HDMI port to all Xbox 360 consoles. Unfortunately, for those early adopters playing on a HD TV/monitor are left with a HDMI-less Xbox 360 unless they went out and bought a new Xbox 360 with HDMI port on it. But those who's original white Xbox 360 didnt succumb to the RRoD (Red Ring of Death) and/or still have the original white Xbox 360, can now have the same ability to play in HD just like all new owners of the Xbox 360. 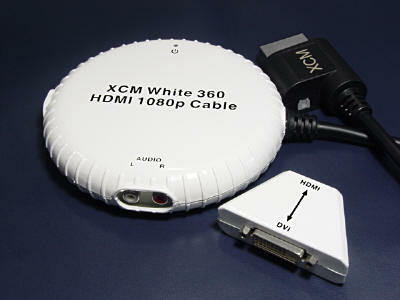 XCM has filled that void by releasing a White 360 HDMI 1080i Cable. Included is HDMI cable, HDMI to DVI adapter, and XCM's nifty device that converts signal to HD. Setup is fairly easy (video below). With the HDMI 1080i Cable, you'll get up to 1080i output from your original white Xbox 360. The same as if you were to get a Xbox 360 Premium, Elite or Halo 3 edition. To get this setup, simply connect the device to the back of the Xbox 360. Take the HDMI cable and connect it to the other end of the device and the other end of the cable to your monitor/HD TV. If you dont have a HDMI port on your monitor, you can use the included HDMI to DVI adapter. Just remember that HDMI supports digital audio through the cable but DVI does not, so you'll need to connect speakers. The device has two RCA audio jacks (red/yellow) for those who are using DVI. If you have speakers that also has RCA audio jacks, simply plug it into the HDMI device. Once all cables are connected, simply turn on the Xbox 360 and you will now have an original white Xbox 360 capable of running in HD via HDMI/DVI. The HDMI device also has a power indicator to let you know that the product is turned on and in use. From what I have tested, the visual quality is the same using this adapter and connecting the Xbox 360 directly to the HDTV via HDMI. I didnt notice any loss of quality. Conclusion : Overall, the XCM White 360 HDMI 1080i Cable is the best solution for those wanting to play in HD on their original white HDMI-less Xbox 360. The only thing I dont like about the White 360 HDMI 1080i Cable is the size of the device. Its approximately 5" wide. Thats not including the cable. But those who still have the original Xbox 360 and want to play in HD via HDMI should consider looking into this device. If you're running out of HDMI ports, consider looking into Talismoon HDMI Switcher with Remote, XCM HDMI/DVI Crossover Selector for additional HDMI/DVI ports. Guests online: 458. Total online: 459. XCM announces XFPS PC Magic Box 2. Use Xbox 360 or PS3 controller with PC games. True Blue JB2 has arrived! Full Review Coming Soon! Play-Asia.com 48 hour Stock Clearance Frenzy starts now! Video: XCM Re-Mapper Teaser. Remap your Xbox 360 controller buttons. Video Game Companies Give Big Donations for Japan Quake Reliefs. Angry Bird Plush Toy Dolls - Pigs and Birds! XCM Announces XCM Re-Mapper. Remap your Xbox 360 buttons. LG attempting to stop the sale of PS3 in U.S.
Review: DSMultiReader: Dictionary and Multi Reader for the Nintendo DS at once. Review: Dreamgear Player's Kit 11 in 1 Bundle Pack"